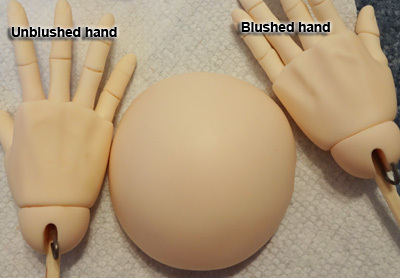 After much practice, trial and error, I feel I can offer a few tips for people who want to blush resins from different dolls to match. I've had lots of failures before figuring out a few things unfortunately T_T So hopefully my experiences can help other people avoid some of the frustrations I've been through. 1. It goes without saying that it's easiest to blush heads, hands or feet to match a body than it would be to blush a whole body to match any other body part. 2. 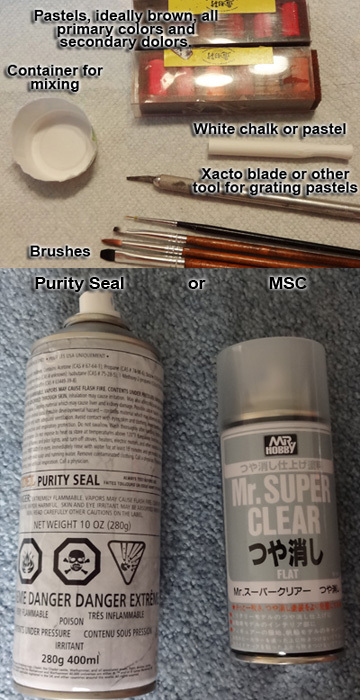 Unless you calculate in the whitening factor of MSC, you cannot use pastels to blush a piece lighter. 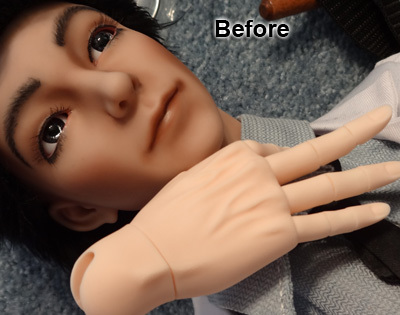 You'd have to airbrush with acrylic paints or some other method to lighten. Iplehouse Arvid in Real Skin on the left below is mine and the body has 2 layers of MSC on it. A single layer should be sufficient to seal the piece you're working on before you begin blushing. 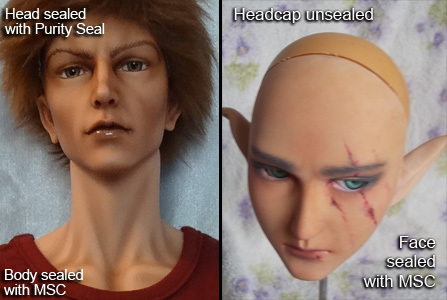 This is to protect the resin itself from being permanently stained, so you can remove the blushing later if you wish. This is the hard part and where all the work is really. I'm not confident that I can explain this well, but I'll do my best. The formula isn't always what you initially think it should be so this is where that water and paper towels comes into play. You'll probably have to wipe the spot you test on several times before you come up with the right color. Some things are rather straight though, like if you have a pink body but a lighter pink head, just blush with some more pink. Most of you will probably be trying to make a subtle change in color, like changing a pink head to match a peachier body or some such. This is why you need to white pastels or chalk. If you use a straight color, most of the time it will be too dark so you mix in white chalk or pastel to thin it. 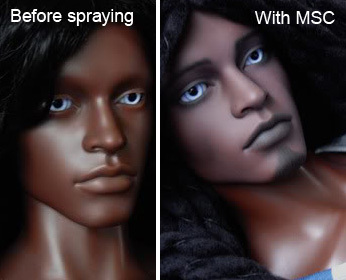 Keep in mind that the white will dissolve somewhat when you spray the sealant on, so you should ideally go for a shade lighter than what you want. It's like if you get white powder wet, it turns translucent. If your pieces are about the same level and you just need to tint, then you'll only need a primary or secondary color with white chalk to make them match. It may be counter intuitive, but it works. 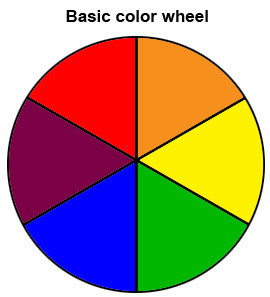 For instance, if your body is a perfectly neutral tone, but your head is pink, to neutralize the pink, you will need it's opposite on the color wheel: green. To neutralize a pink tone, just mix some green pastel with white chalk or pastel. Mix any 2 of those and you get brown. You probably wouldn't really think of green and purple in terms of skin much usually, but some tan resins actually have a pretty green base (possibly the reason for greening instead of yellowing?). I found that was the case with my Iplehouse Lee. Since it's a darker tone, I use a bit of brown. The brown that I am using here is reddish, so I added some orange to tint it in that direction. I added quite a bit of white chalk to the mix because although I'm going for a shade darker, a little goes a long way so it the color had to be thinned. I didn't realize the brown was THAT red till after I tested it though so I ended up having to mix a bit of green in to tone that down. 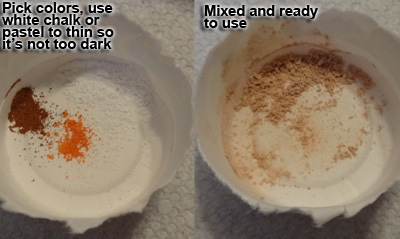 The mix doesn't always look the same when you apply it, so you may have to wipe and adjust the mix several times before finding the right tone. No real trick to this. 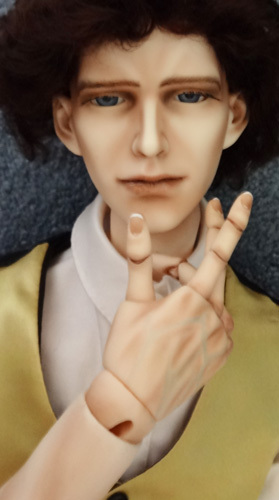 Just use any brush that feels right to brush the color onto/into the resin evenly. 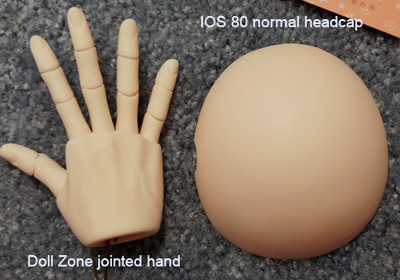 Oh actually, there is a trick if you're doing jointed hands and you want to make sure the joints are the same color as the rest of the hands. 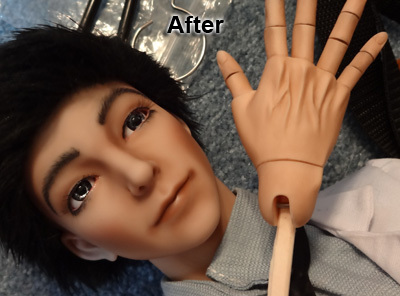 You'll have to do the first coat on the hands with the palm flat, fingers straight out. 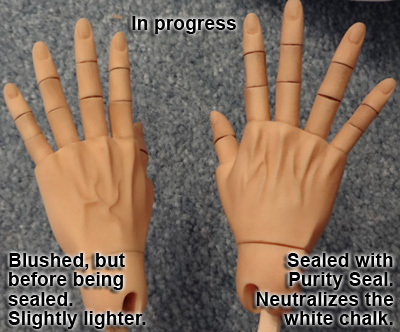 Then once you've blushed and sealed the hands, you'll need to curl each joint, blush each joint, then spray the hands in that curled position so that you don't have different colored joints in your hands.